I think that one of the least favorite parts of seed starting for everyone is the process of thinning seedlings. I hate it too! For that reason, I try very hard to only plant one seed per pot. I even plant extra pots “just in case” so that I don’t have to thin or transplant lots of seedlings. Of course, unless you are perfectly dexterous every time with tiny seeds, there are times when you end up with more seeds than you want in one spot. 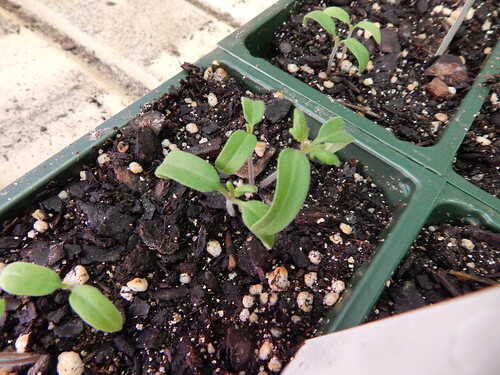 If you have a couple seedlings in one pot, but on opposite sides, it isn’t the end of the world. They will usually be easy to divide later on if you want to. 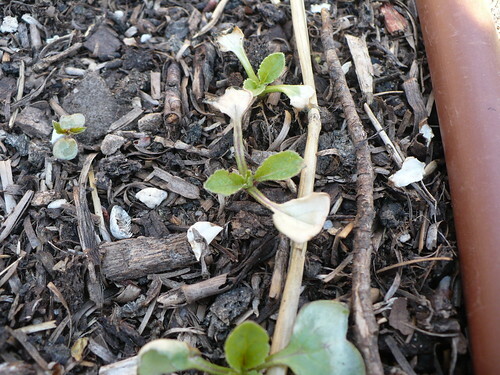 The hard part is when you have more than one seedling growing from essentially the same spot, like you can see here. When that happens, it is usually best and easier to just snip the two weaker seedlings off right at the soil level. I KNOW that it is so tempting to just let them be. If you do that, you are ultimately compromising the ability of each individual plant to grow. 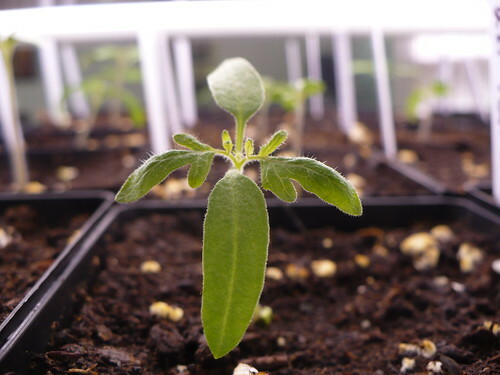 If you just can’t bear to kill the other seedlings, then you can try to divide and transplant them. 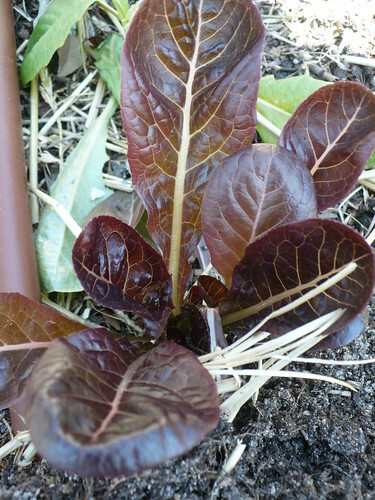 The key to this is to do it at this stage, when the seedlings are just starting to put on their first set of true leaves. They have large enough roots to handle it, but not so large that you will cause major damage when you separate the seedlings. 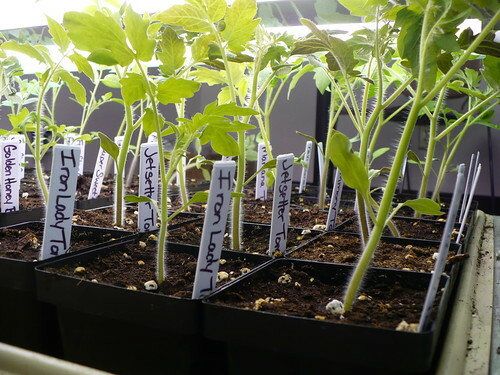 After thinning and a little bit of transplanting this afternoon, I have over 150 tomato seedlings growing in my office! Most of them are the heirlooms we’re going to try out this year, and I can already see differences in plant vigor as the seeds germinate. 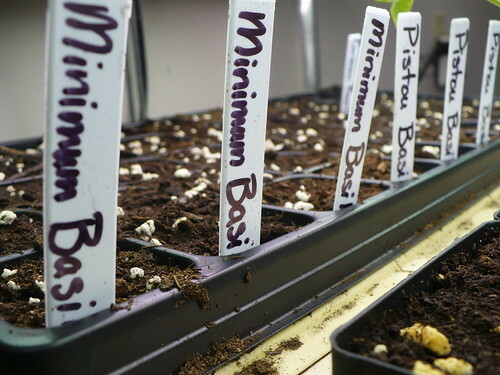 So…I know it is hard, but if you have started seeds already, make sure you thin or transplant your extra seedlings soon! Can you believe that in only 2 weeks I will start moving these little guys outside to harden off? Another week, another cold snap. It looks like we may be in for that same weather pattern next week. UGH! I found this mini iris blooming and couldn’t resist picking one. 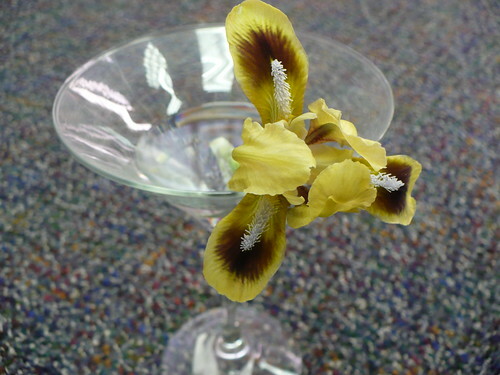 When I went looking in response center cabinet for a small vase to use, I found this big martini glass. I have no idea what it was doing there, but I couldn’t resist using it for the vase! 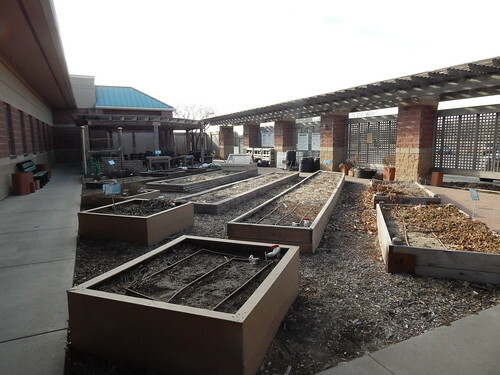 Hmm…can you tell it’s been a while since we weeded last? 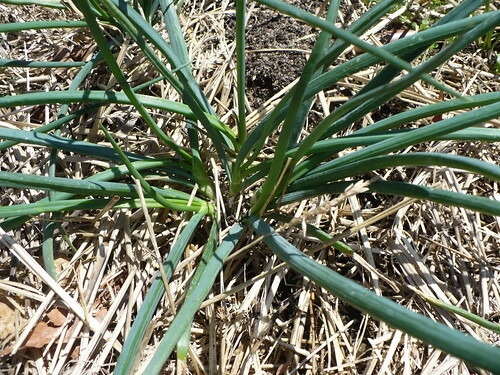 Can you tell which is the shallot and which is the grass? 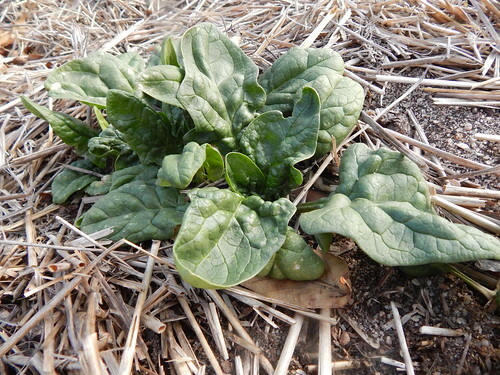 I’ll give you a hint – wide and flat bright green leaves are one and the tubular blue-green leaves are the other! There, that’s better! Now you can see the new growth coming from the center of the plant. 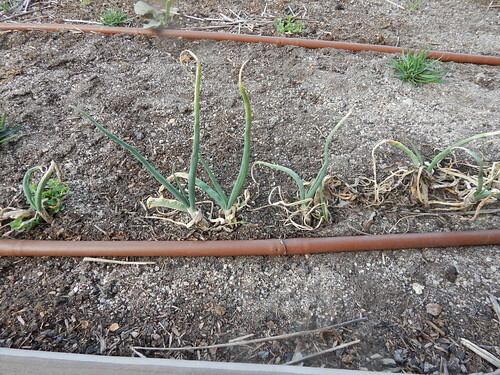 It looks like some of the shoots are going to divide at least one more time. Yes, this is the same lettuce from last week. It hasn’t grown a lot, but the new leaves are definitely another shade darker. There is a benefit to those random blasts of cold weather! We are starting some of our basil varieties from seed this year rather than just buying the plants. I was supposed to plant them last week, but with our crazy weather I knew we weren’t going to be ready to put them outside until mid-May. 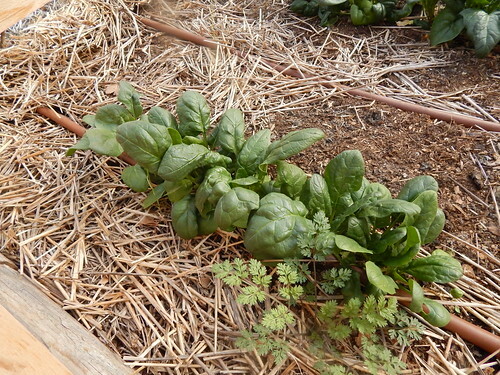 Basil doesn’t grow quite as fast as tomatoes, but almost. 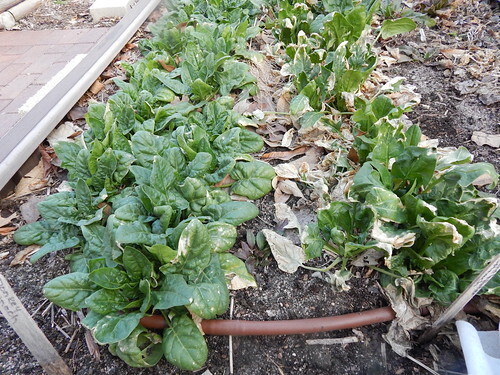 The radishes in the Root Vegetables garden are looking great, but these that we planted in the Kids’ Snack Garden look like they’ve been scorched. Not sure if it was sun or cold or wind, but the seed leaves are goners. Luckily it looks like the true leaves are going to be fine. This is the third time I’ve tried to show you this picture. I was having trouble getting the bud in focus. 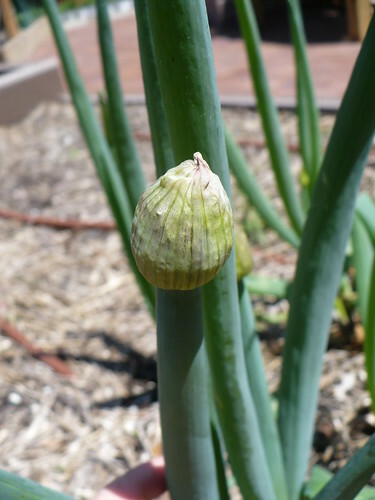 This is a flower bud on one of the Red Beard Onions that we planted last fall. I keep expecting the flowers to burst forth, but I think the weather is holding things back. Our tomato seedlings have really taken off. In fact, I think they are a bit more leggy this year than some years. I’m not a fan. These plants are just 3 weeks old! Well…the seeds were planted 3 weeks ago today. This is why I try very hard to start our tomatoes no sooner than 4 weeks before we want to plant outside. Normally I would be starting to put them outside for hardening off right now – except that it’s only 44 degrees outside. Yeah, not so much. Most years I insistently hold the line on not planting our tomato plants before the first week of May, and this year I decided that we could plant on April 23rd so they were in before Herb Day. (I’m going to be away from the garden on April 30th.) Well, at present they are still forecasting overnight lows below 40 degrees for next week. No tomato plants going outside here! Yes, I suppose we could break out the milk jugs (ugh, they blow away in the wind!) or the wall-o-waters (ugh, expensive!). But I don’t really think there is much benefit to doing those things at this point. Part of the reason the plants are so leggy this year is that they level of my light stand they are on has 2 of the 4 fluorescent tubes burned out. I think it is the fixtures, because the same tubes are burned out every spring. The peppers and eggplant under the middle tier aren’t getting leggy yet. 1. Moved them to the bottom tier of lights where there are 4 tubes working. 2. Placed the lights as close to the tops of the plants as possible without actually touching. 4. Keep my office cooler…yeah…I can try! 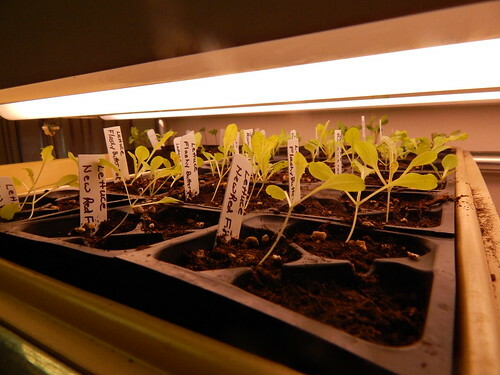 Whenever you are getting leggy seedlings the keys to keeping them shorter are: more light, closer/brighter light, cooler temps, less fertilizer, less water. 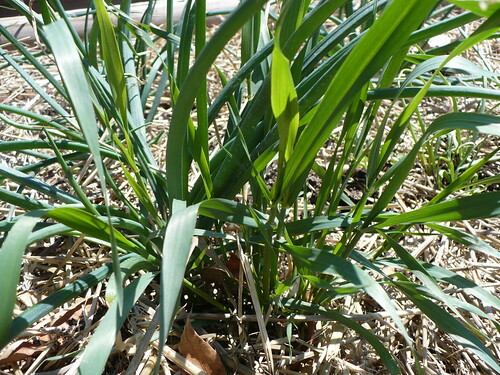 Even small differences can make a big difference in the growth of your plants. Oh yeah, and I’m hoping that the forecast straightens out into something more closely resembling mild spring weather. This is going to be a quick edition, cause it’s late on Friday afternoon and I’ve got things to do! Some of the herbs that I thought were dead dead dead are actually coming back. 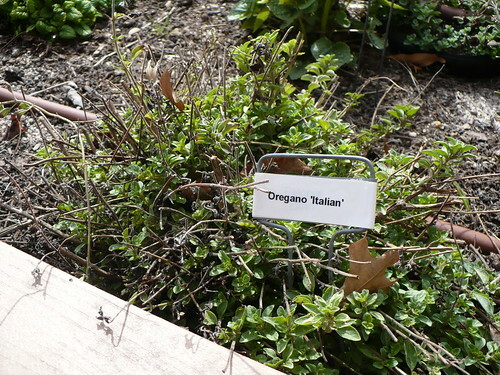 This oregano still needs a little cleaning (oak leaves, anyone? ), but it is looking healthy! 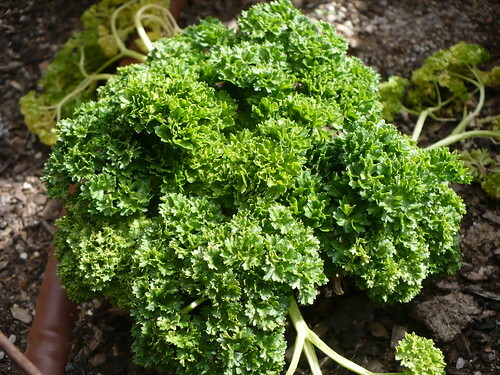 The curly parsley is well on its way to a second growing season after surviving the winter. If we let it keep growing, it should go to seed at some point this summer. 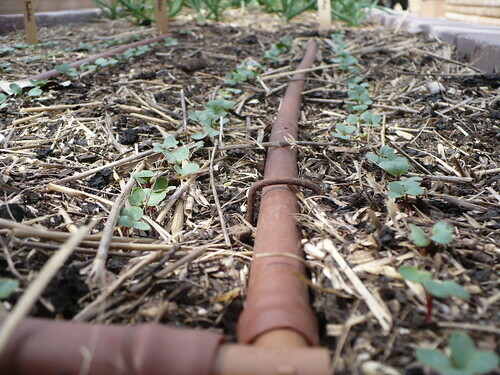 The radishes are finally coming up! I think the cold slowed them down some. No sign of parsnips yet, but that’s not a surprise. We have true leaves! A few of the peppers and eggplant are still dawdling about germinating, but the tomatoes are moving on to the next set of leaves. Have a great weekend! Tomorrow you can come on out and enjoy Tree Fest from 8 am to 1 pm, the Kansas Grown! 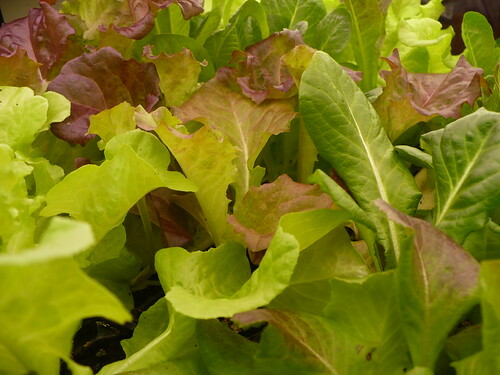 Farmers’ Market from 7 am to noon, and the first Saturday Sampler on salad greens from 9 to 10 am!